As the chillier months hit most of the states, it is time to make menu changes to keep dishes relevant. Winter menu planning is now. Delicate zucchini, little heirloom tomatoes and sweet berries are heading south for the winter. Dig deep to pull out the more burly elements of your repertoire. We still serve tomatoes on a burger, even in February. So seasonal menu changes aren’t always the only impetus to change. Rather, bending around customers’ desire to beef-up their plates makes sense for this time of the year. Reflect those changing tastes to keep seats full and not look like you missed the flow of the seasons. Baked and roasted dishes, for instance, play on the sentiment of the season versus simply grilled or chilled preparations. Chicago’s Boka gets all seasonal with cold weather’s shiny elements, like caramelized celery root and cabbage with their roasted venison dish. And their roasted chicken is equally winterized with preserved mushrooms, rutabaga and delicata squash. Opportunities to capture interest—and sales—present themselves in the form of abundant produce and seasonal ingredients. Take advantage of what the universe provides by latching on to less expensive commodities (this is a seasonal indicator). Butternut squash are plentiful and at a lower price than at any other time of the year. 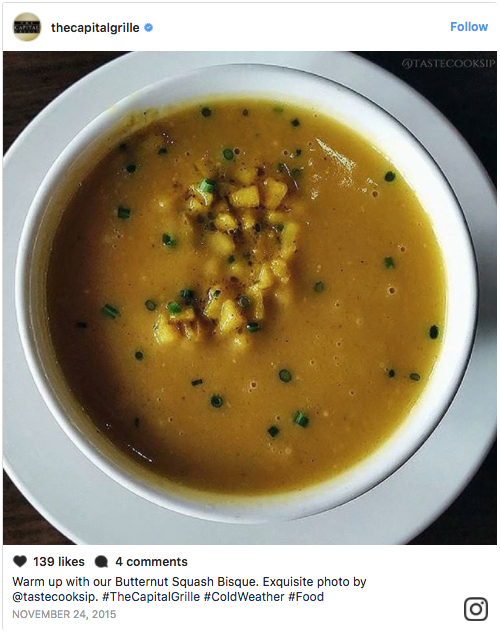 Take Capital Grille’s butternut squash bisque; it gets a double-dose of cold weather flavors with a hit of curried fall apples. Hearty greens, like collards and cabbages, are at their best when their price is lowest as we get towards winter. That is a big win for operators and consumers alike. Share the seasonal good vibes across the table while still collecting good margins. Run a velocity report and use what your customers tell you. Avoid ditching at least the core twenty-percent of the menu that grabs the most sales. At the same time, build in some thought provoking pieces that look the season. Latch on to sweet potatoes, for example, in a brunch dish or soup. Laced with the nostalgic aromas of ginger, clove, nutmeg and cinnamon, the dash to winter menuing becomes easier. At Maya in Charlottesville,Va., sweet potatoes ride with the charred vegetable lentil cake as well as other cold weather favorites like a puree of root vegetables and kale. Keep the high-margin, high-volume dishes rolling as to not alienate your base. At the same time, a little extra flavorful melody plays well for the regulars looking for some interesting notes. If they can make it at home, they don’t necessarily need you. Instead, you can call it: Nostalgic. Classic. Upended. Fan favorite. Wordsmith away! Give all the good feels of braised dishes, hearty-crusted pies and punchy pastas. At Philadelphia’s much-touted Kanella, the braised lamb is evidence that a humble and hearty dish can get up-ended without being a slow-cooker convenience item. Keeping the portion size tight, for instance, avoids the perception of a cheap dish, which it isn’t. With attention to cooking times and not getting too stew-heavy, combination cooking can make less expensive cuts of protein oozes the love that mingles with heartier vegetables for all that warming mojo. Even if it isn’t catering, holiday gatherings, happy hour meet-ups, and larger group dinners are considerations for this menu version. Even without a catering or in-house special events’ piece, shareables and family style sized portions get movement. While it may be a shift in your menu branding, consider offering platters to ease the burden on the functionality of the kitchen as well as bringing a little community feasting back to the table. In the spirit of the forthcoming holidays, family-style plates, even just appetizers, can get traction in giving the new menu a little kick of excitement. Keep the kitchen’s ability to accommodate the onslaught of holiday revelers by embedding items that are executable. It is wobbly footing to retool the whole menu for the season, there is room to grow dishes and drive participation as the weather turns. A solid menu revision can boost sales, often to the tune of a fifteen-percent bump to the top line. Don’t forget all the engineering pieces, like placement, pricing and trend factors, that make for successful menus. Managing ingredients by using a bit of the best of what’s around and the bottom line reaps the benefit of the work.